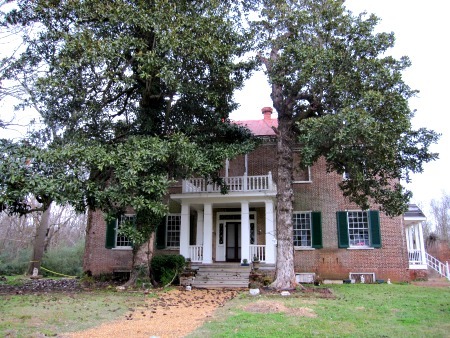 Sweetwater mansion is a plantation house located in the area of Florence, Alabama. It was built by General John Brahan who was part of the Alabama militia during the war of 1812 and who owned more than 4000 acres of land in the area. The 8 roomed house was first lived in by John Brahan's son in law, Robert M Patton who was a post civil war governor of Alabama and he completed construction on the mansion in 1835. The mansion is now privately owned and is listed on the national register of historic places. The number of ghost which linger at the mansion is unknown, as the various paranormal research groups which have conducted investigations of the property have come up with rather varied answers, but it is thought to be around 5. The most common ghostly happenings at the mansion seem to be apparitions, especially those of union and confederate soldiers, which would make sense as the house was used by officers of the two armies during their respective occupations of the area. Activity at the house has been reported for quite a few years, with one live in caretaker refusing to go into some of the rooms. A story told by the caretaker among other people is that of seeing the body of a soldier with a gun shot wound in his head lying in a coffin in one of the downstairs rooms. The caretaker later learnt after seeing this apparition a number of times that the son of the house's first occupant, Robert Patton lost his son in the battle of Shiloh and the ghostly coffin was always seen in the exact spot in which the coffin was laid during the funeral. The last caretaker to live in the mansion was so terrified of the activity going on here that she nailed one of the doors shut in an attempt to isolate the paranormal goings on. There has been a number of paranormal research and psychic groups who have conducted investigations of the mansion, and there are a number of things which they all found on their separate, independent investigations. The first is the figure of a civil war soldier dressed in his uniform which has appeared both in front of the investigators and on photos. His identity is unknown but he is thought to be the spirit of Patton's son who's funeral was conducted in the mansion. An episode of "Paranormal State" featured the mansion in an episode shown on April 25th, 2007 where the investigators found some spooky findings. The team were witness's to a roof tile which seemed to fling itself across a room, as well as a board which slid all the way from one side of the floor to the other by itself. Photos taken during the investigation later revealed two small mist like figures which seemed to be that of children.